With the STIHL HT 75 pole pruner, branches up to the height of approx. 5 meters can be cut. Features a two-stroke engine, anti-vibration system, elastoStart and tool less filler cap. 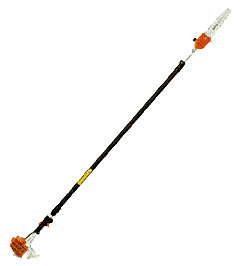 With the STIHL HT101 pole pruner, branches up to a height of approx. 5 metres can be cut. With STIHL 4-MIX engine. The HT131 pole pruner can be used for thinning out branches up to a height of 5 metres. With STIHL 4-MIX engine. Hedge trimmer with double-edged blade for cutting back; 3000 strokes/minute; low blade speed and a more powerful cut. Hedge trimmer with double-edged blades for trimming; 5000 strokes/minute; high blade speed and a finer cut. Hedge trimmer with single edged blade for cutting back; 3000 strokes/minute; low blade speed and a more powerful cut. Hedge trimmer with single-edged blades for trimming; 5000 strokes/minute; high blade speed and a finer cut. This reliable STIHL hedge trimmer is quiet and has an anti vibration system to allow for comfortable operation. Additionally it also has a 5-position rotating handle for flexible and smooth cutting. This powerful electric hedge trimmer with it's anti vibration system and 600-Watt engine can confidently be used to handle thicker branches. It has a 5-position rotating handle and comes in two bar lenths. The STIHL HSE 81 is a robust electric hedge trimmer with a very powerful engine and ergonimic design. With it's two-sided diamond cut blades and its 5-position rotating handle it easily manages dense woody hedges.